Turkish President Recep Tayyip Erdogan said on Friday that his forces are prepared to push all the way across Syria to the Iraqi border in their campaign against Syrian Kurdish forces, fueling fears that Turkey’s incursion will trigger a new refugee wave and could end in a confrontation with the U.S. military. “Operation Olive Branch will continue until it reaches its goals. We will rid Manbij of terrorists, as it was promised to us, and our battles will continue until no terrorist is left until our border with Iraq,” Erdogan said during a speech in Ankara on Friday. Before the Turkish president made these remarks, there was apprehension about Turkish forces pushing beyond their initial objective of Afrin to Manbij, where U.S. troops are deployed. Erdogan seemed to be not only confirming that Manbij would be attacked, but that he will push even further east. American troops were deployed to Manbij in part to keep hostile Syrian rebel factions from attacking each other, and to keep the Turks from moving into the area. Also, the U.S. response to Turkey’s incursion has been somewhat muted so far because American officials say the Kurdish forces occupying Afrin are not directly linked to the anti-Islamic State operation or the Kurdish militia commands supported by the United States. That delicate diplomatic position will become untenable if Erdogan strikes eastward and begins hitting Kurdish units that unquestionably are part of the battle against ISIS. In an interview with Reuters, Erdogan adviser Gulnur Aybet implied one goal of Turkey’s drive into Syria is to force the United States to reassess its policies and show more respect for Turkey’s positions. Reuters notes that Aybet implied the “alternative solutions” Turkey desires pertain to restoring “restoring trust between NATO allies” so that American proposals for a “safe zone” on the Turkey-Syria border could be taken seriously. One of Turkey’s biggest complaints along those lines has been U.S. support for Syrian Kurdish militia forces, which the Erdogan government sees as allies of Kurdish separatists in Turkey. Among Turkey’s greatest fears throughout the Syrian civil war and battle against ISIS has been the possible formation of a new Kurdish state that would consume portions of Turkey, Syria, and Iraq. Erdogan’s address on Friday included the latest iteration of his slam at the United States for arming Syrian Kurdish forces he considers to be terrorists. “We will continue to fight until no terrorist is left on our borders. Our only concern is to ensure our national security and the safety of our citizens and our Syrian brothers and sisters,” Erdogan insisted. 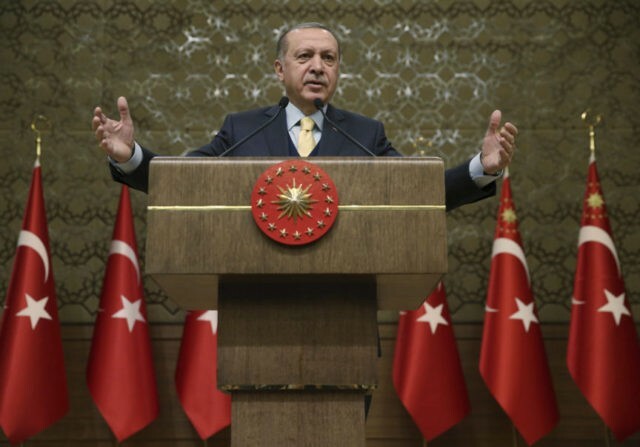 Erdogan compared his Afrin-and-beyond operation to Turkish military interventions in the fall of 2016 against al-Rai and Jarabulus, which were towns held by the Islamic State. The Turks said Kurdish YPG forces would also be targeted during those operations. “Those who support the terrorist organization will become a target in this battle. The United States needs to review its soldiers and elements giving support to terrorists on the ground in such a way as to avoid a confrontation with Turkey,” Bozdag warned after Erdogan spoke with U.S. President Donald Trump by telephone. Turkey has disputed the White House account of that phone call, which holds that Trump pressured Erdogan to scale back his operation in Syria. Instead, Turkish officials claim Trump promised to stop supporting Kurdish forces. Yeni Safak columnist Ibrahim Karagul, a reliable barometer for the more hot-blooded pro-Erdogan wing of Turkish politics, was positively spoiling for a fight with the United States in his Friday editorial. Karagul declared the U.S. is “no longer a trustworthy country for Turkey” and none of its guarantees can ever be trusted again because the U.S. has been using ISIS, the Kurdish PKK separatist group in Turkey, and of course the treasonous followers of Fethullah Gulen as proxy forces to wage a covert war against Ankara. He said the American goal is to destroy Turkey by provoking a civil war similar to the one in Syria, which he claimed the United States also orchestrated. This plan is identical to the map operations the Crusaders applied in our region. The entire region spanning the Mediterranean and the Iranian border are being dehumanized, and cleared of Arabs and Turkmens; demographic deportation is being applied. This zone that is being vacated is going to be turned into a foreign garrison and filled with U.S.-Israeli military bases. All attacks on Turkey and the region will be made from this zone. Turkey is showing and is required to show the same resistance that was shown toward the invasion of Anatolia after World War I. Now, the national struggle, a new war of independence, and homeland defense are all being carried out against the U.S. and its close allies. Most disturbingly, Karagul called for Turkey to immediately shut down Incirlik Air Base, a vital base for American air operations in the region, because in his fevered imagination the United States is coordinating ISIS and PKK forces from there. He predicted a coming moment when “thousands of people surround and siege the Incirlik base,” an event that would threaten the safety of thousands of American personnel and their dependents. Threats against the air base are a common expression of anti-American sentiment in Turkey, even from sources otherwise critical of Erdogan. American officials have good reasons to worry that Erdogan could arrange a mob action against Incirlik if he doesn’t like the U.S. response to his actions in Syria. Deutsche Welle reports that European leaders are growing uncomfortable with Erdogan’s action in Syria as well. EU foreign policy chief Federica Mogherini warned this week that Turkey’s invasion could undermine U.N.-backed Syria peace talks in Geneva.